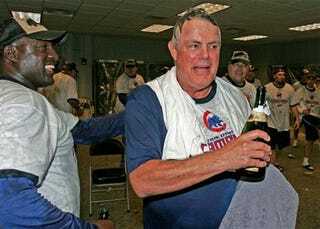 What happens when Lou Piniella has nothing else to yell about? Does he grumble that the champagne isn't Korbel? If it is Korbel, does he kvetch that it's not another brand name bubbly? Does he still find some way to throw his hat and choke a child? We may never know the answer, because we're too lazy to ask anyone. And at this hour, it would be rude to ask the Cubs anything, other than what they want for breakfast, because they're all tuckered out from winning the NL Central last night. Yes, National League teams actually clinched playoff spots on Friday. Coupled with a Brewers loss, the Cubs magic number finally decreased to Gilbert Arenas with a 6-0 win over the Cincinnati Reds. They've earned their second division title in five years. The only question left is what new mythical happenings will assist the Cubs in throwing the NLCS away? Here's to hoping it's a strike three passed ball. The 706 Level. Lost amidst the national frenzy surrounding Jimmy Rollins Jimmy Rollins single-season at-bat record, the Phillies happened to win their game, 6-0 against the Washington Nationals. Isn't that always how it works? You get so focused on one player all season that you ask your buddies how many at-bats Rollins had any given night — getting disgusted when you find he was just walked all night — that you fail to look at the final game score. So I'm sure Tim Redding is ashamed that he'll forever be the pitcher linked to getting Rollins to fly out in the second inning last night in hits record-setting 706th at-bat of the season. But that Trivial Pursuit question pales in comparison to the fact that the Phillies have just dug themselves out of a seven-game deficit in the NL East, and find themselves in first place. It ain't always about illustrious baseball records. How fitting that the Shea Stadium staff played Journey's "Don't Stop Believing" for the start of the ninth inning. Remember, Tony Soprano got whacked (or not) to that song. Either way, the screen went black, and the same is about to happen to these Mets. That's right, Mets fans. Baseball is like a Sopranos finale. Write your own ending. Don't watch this weekend. You might not like what you see. SNAAAKE! SNAAAKE! AH, IT'S A SNAAKE! In a last-ditch effort to get someone to notice them this year, the Diamondbacks had to go and win the National League West with a 4-2 win over the surging Colorado Rockies. Maybe now someone this side of Tim Kurkjian will think about them. Maybe not. Two More Spots Left, Cue The Musical Chairs Song. We still have an NL East and Wild Card left to claim. Right now the Mets are just one game back of the Phillies in the East. The San Diego Padres have the inside track for the Wild Card, with two-game leads over both Colorado and New York. Basically, wins by San Diego, Philadelphia and Florida today will secure all eight playoff positions, rendering Sunday slightly boring.